The bathroom is possibly one of the most overlooked places when it comes to modern décor and trends. While many people focus on updating the living room or bedroom, the bathroom is one room you do not want to forget. 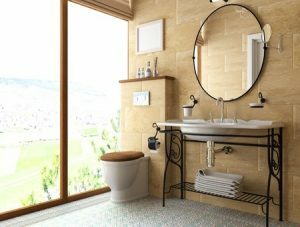 The bathroom is a place your family and guests will use regularly, and paying special attention to your mirror use and placement will set you up as trendy and fashionable in the housing world. Here are some ways to brighten up your bathroom using mirrors. When your bathroom is already fully decorated with multiple patterns, prints and décor, HGTV recommends choosing a simple mirror placed over the sink to balance out the atmosphere of the room. You may also want to consider adding two small matching mirrors placed side-by-side for a more modern look, regardless of whether you have a his-and-hers setup or a single sink. Well-placed mirrors of varying lengths can also achieve different looks for your bathroom. If you have a smaller bathroom, long and lean mirrors can give a more expansive feel to the space. Using multiple mirrors in different places around a larger bathroom can also make it seem more roomy, providing the appearance of a more comfortable amount of space. Many modern bathroom designs use mirrors to reflect natural and artificial light, while utilizing skylights and windows to enhance the room’s beauty. Lighten up your bathroom with a mirror frame surrounded by illuminated LED lights to wow your guests, suggests Bathroom Designs. Consider adding in a large mirror with decorative accessories and incandescent lights behind the glass to really brighten up the room. Contemporary mirrors come in many styles, sizes, finishes and shapes. Utilizing different shapes gives you the freedom to complement or soften other features of your bathroom. For example, using oval mirrors can offset sharp edges of vanities or other décor, says HGTV. Ready to modernize your bathroom? Affordable Glass and Mirror offers a vast selection of mirrors, including full-mirrored walls, cut-to-fit picture frames, vanity and hanging mirrors and standard and custom bathroom mirrors. Learn more or get an estimate today by calling 404-361-5151.